RadLiveTile is designed to load content on demand from a Webservice on a predefined interval. It supports various webservice types like WCF services, Page Methods and OData services. The RadLiveTile control was added to the Telerik® UI for ASP.NET AJAX suite in Q3 2013. When the UpdateInterval times out a request to the service is made and when the data is received the ClientTemplate is populated and shown with an animation. If a PeekTemplate is shown at this point it is hidden regardless of its own timers because the ClientTemplate has higher priority. The ClientTemplate property can be used to set the template that will be resolved and populated with the information from the datasource. The UpdateInterval property determines the intervals between requests are sent. The ClientTemplate can also be used as an inner tag in the tile. This allows for more intuitive markup input, even though you cannot have intellisense because Visual Studio does not offer intellisense for string properties. Path: the URL of the Webservice that will be called. 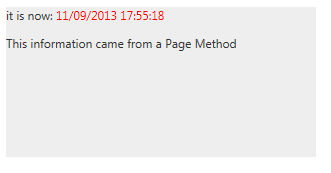 This is the path to the asmx or svc file that defines the service code or the page whose Page Method will be called. The ODataDataSourceID property of the RadLiveTile can be used to set the ID of a RadODataDataSource control that will be used to contact the OData service. You can use the OnClientDataLoading event to pass additional information or modify the request. The Value property of the Tile is used to transfer information to the web service that provides the actual data. It can be used to identify the tile that makes the request in order to provide specific data. For more information and examples see the Pass Data to the Web Service help article. Each load-on-demand type is shown with a simple example that also shows how to consume the Value property. The Path property of the RadLiveTile.WebServiceSettings is set to the current page. arguments are not passed to the method, nor the returned object is complex. More information on passing arguments and working with the returned data in the template is available in the Loading Data help article.